August 2014 IS THIS THE FACE OF A KILLER KOP? 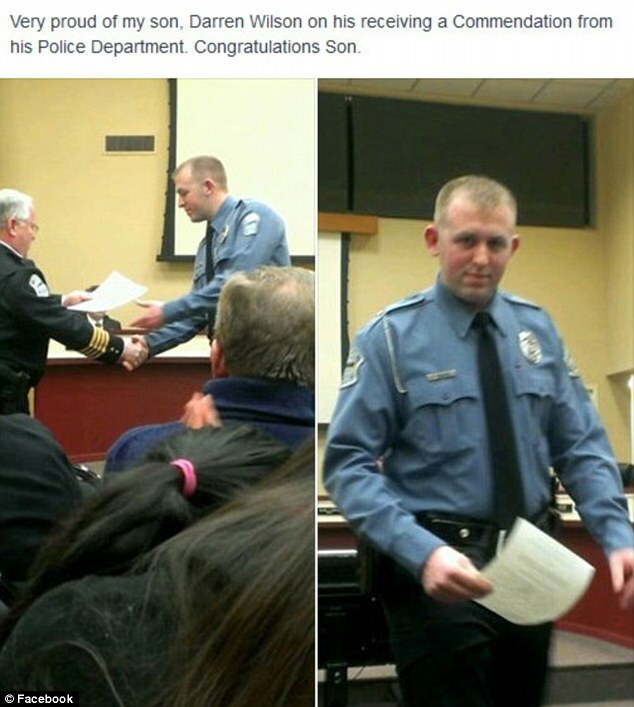 ‘White’ DARREN WILSON in Ferguson, Missouri…. IS THIS THE FACE OF A KILLER KOP? — The Ferguson, Missouri 6-Year Veteran ‘White’ Police Officer DARREN WILSON whose gun reportedly discharged multiple times and ended the life of Unarmed ‘Black’ 18-Year-Old Michael Brown on 9 August 2014. BlackParentSpeaks has been aware, involved, lived and remained ‘Black’ long enough to witness the repeat of history over and over and over again. White America continues to grapple with its racist past, present, and future. The 9 August 2014 killing of unarmed ‘Black’ 18-year-old Michael Brown in Ferguson, Missouri by Ferguson six-year veteran ‘White’ Police Officer Darren Wilson is a typical in-our-face reminder of racism and everyday life in America. Overstanding the message sent as a result of the killing of unarmed 18-year-old ‘Black’ Michael Brown by ‘White’ Police Officer Darren Wilson, BlackParentSpeaks has visions of the 1967 Washington, DC Police killing of another Black youth – c. 18-year-old Clarence Booker. Youthful and unarmed Clarence Booker was shot and killed ‘allegedly’ as a result of the most-grievous crime of littering. BlackParentSpeaks was one of the many many many Black folk who proactively ‘took to the streets’ of DC, organized, and demanded and ‘successfully’ helped in holding White folk accountable for their racist actions. OUR unrestricted and unlimited actions helped in forcing ‘real’ change in our nation’s capital. Do NOT let the media, White-thinking folk or others choose your words or actions. White folk riot — Black folk do not! We Blacks are involved in a rebellion — not a riot! We have overwhelming reason, justification, and purpose for the actions we take in rebelling against injustice and racism. WE Blacks are the victims of White racism. WE are the victims of 400 plus years of slavery, discrimination, unpaid forced labor and more…. Black people can never even come close to reclaiming all that is owed us and our people! That said…. Before any settlements or talks of settlements are had, BlackParentSpeaks offers the following bits of wisdom. 1. Demand and get in writing a legally binding agreement with ALL law enforcement agencies (local, City, County, State, and Federal) that clearly guarantees that NONE of the demonstrators, protesters (so-called “looters, etc.”) will be prosecuted for ANY so-called illegal activities that followed the killing of ‘Black’ Michael Brown by Ferguson, Missouri ‘White’ Police Officer Darren Wilson. This demand should be NONnegotiable. If not, the Police will pick you off one by one and file charges against you once the eyes of the nation and world are no longer watching or interested in the events in Ferguson, Missouri. BlackParentSpeaks also strongly suggests that you require a public statement by a government official (perhaps your overseeing ‘White’ Governor Jay Nixon) expressing that the people’s anger and actions were overstandable and no prosecutions or charges will be imposed against any of the protesters or demonstrators or so-called “looters, etc.” who took to the streets following the killing of ‘Black’ Michael Brown. Further, any and all already filed charges or prosecutions will be dropped and/or dismissed. Note: Missouri ‘White’ Governor Jay Nixon might want to include in his statement a piece about ‘us all working together to heal the racist divide’ that has PUBLICLY surfaced as a result of the ‘White’ officer shooting and killing of unarmed 18-year-old ‘Black’ Michael Brown…. 2. Demand the return of all cell phones, Laptops, IPads, cameras, film, footage, pictures, text messages, and other items seized, confiscated, and illegally taken from demonstrators and protesters by law enforcement during the aftermath of the killing of ‘Black’ Michael Brown. In the event that any item is not returned in its original prior-to-seizure condition (as determined solely by the victim of the seized item), a lump sum government payment of $2500 is to be issued forthright to the victim. Further, that $2500 will NOT be counted as income to the victim under any charitable or assistance programs, local, City, County, State, or Federal programs or entities. And, the payment is NOT reportable on any income tax returns or used to determine eligibility for any government or private or charitable programs including Food Stamps, Housing, and other assistance and help programs. All who had their personal property taken by law enforcement should ‘assume’ that texts messages, contacts, pictures, etc. have been copied and could be used in future attempts to create havoc and problems for them. Please do not underestimate the anger of those who are determined to ‘hush’ your righteous cries for justice…. Of course, there are other demands that must be put in place and there remains the charge to hold Ferguson, Missouri 6-Year Veteran ‘White’ Police Officer DARREN WILSON accountable…. I strongly urge the Black folk of Ferguson, Missouri and throughout these United States to recognize that the fight to lessen and end racism is serious business. Know that you are freedom fighters and you are not alone in this struggle. Please do not fall prey to ‘smiling faces’ or words designed to separate us from each other – no matter the race, job, or position of the person speaking the words. BlackParentSpeaks says ‘Right-On’ to ALL who have taken to the streets in Ferguson. I say use ‘whatever means is necessary’ to get answers and righteous justice. By the way, the audacity of a ‘White’ mindset to tell Black adults that they must stay inside and not venture outside of their homes because of a racially-discriminatory CURFEW is beyond angering to me! Do not let yourselves be corralled or caged. Simply put, Black people are human beings and Black people have the right to walk and travel the streets like any other people. Please do NOT let others frighten you into accepting apartheid in Ferguson, Missouri. Categories: Activism, Current Events, Education | Tags: America’s Black, Black Consciousness Movement, Black people, Black Power, Community Organizing, Ferguson, Michael Brown, Race and ethnicity in the United States Census, Racism | Permalink.